It was almost sunset, and the day had been wonderful. The Vietnamese government could have hung me upside down outside the War Remnants Museum, and I'd still have enjoyed myself. I would've watched the passing motorcycles and waved hello to the folks who would be staring at me. I would have pondered the life of a bat, the shape of Earth, and the points of the residents' conical hats. Never had I been to a place where I had so quickly fallen in love with the people. 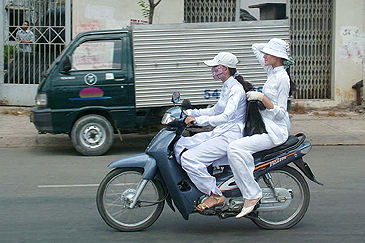 While for many Americans the word Vietnam will always be synonymous with war, for me — at least after my visit here — the word would conjure up something else: a nation where the glances, laughter, and good wishes of a people had fused into a gentle caress that ran over my entire being, leaving me befuddled at how merely being with strangers could delight me so. The morning had begun with a search for good photo opportunities on the streets of Ho Chi Minh City, a city I still refer to as Saigon. I crouched low over a curb to capture the reflection of Notre Dame Cathedral in a puddle of the previous night's rain. I sheepishly entered a salon to beg — successfully — to be able to take photos of hairdos in progress. I took pictures of a family slurping noodles, a woman selling bread, and a poster of Brad Pitt hanging on the wall of a grocery store. Finally, with my confidence at its peak, I meandered into a manicure and pedicure shop, requesting to photograph people's freshly painted fingers and toes. In pursuit of more pictures — and feeling that there was nothing I could not photograph while my negotiating skills were in top order — I took an afternoon bus to Cholon, the district also known as Chinatown. It was a gritty side of the city I hadn't seen before, and there were no other tourists in sight. 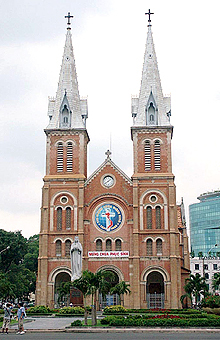 The late 19th century Notre Dame Cathedral in Ho Chi Minh City has a neo-Romanesque facade with twin towers. A statue of the Virgin is located in the center front. With an excitement similar to what Columbus may have felt upon first seeing the Americas, I discovered the rice depot. It was an entire street devoted to packaging rice — and a reminder that Vietnam is a large rice exporter. Graceful women wearing colorful clothes and conical hats sat in piles of the product, their bare feet mingling with the symmetrical grains as they scooped up basketfuls to sift out impurities. I fell head over heels for this street, filled as it was with rice, laughter, and photo-willing people. Only with effort did I pull myself away in order to explore other parts of Cholon. I wiggled my way through a market (the literal meaning of Cholon is "big market"), talked with a man resting in his hammock, and bought boiled corn on the cob from a street vendor. Then, seeing the steeple of a Catholic church off in the distance, I headed that way. Pushing open the creaking door, I slid into the empty sanctuary and took a seat in the back row. The silence was palpable, and I appreciated the respite from the hustle and bustle of the nearby market. But what I will remember most about this church is the sentence I found inscribed on a plaque embedded in my pew. It said that this was the pew on which the President Ngo Dinh Diem and his brother, Ngo Dinh Nhu, had sat before they were taken on a tank and killed on the way to Saigon on Nov. 2, 1963. I struggled to take in what I had just learned. Once, the president of South Vietnam sat on this very pew and watched his world turn upside down and prepare to crush him. And now, 44 years later, an American backpacker was in the same pew, finding it a convenient place to change a roll of film and spend some peaceful moments. As I sat in the small church, time stood still for a moment — just long enough to show me that, really, it never stands still. Time moves slowly, but it does so with the force of an ocean's tide. It sweeps away past realities even as it brings in that which is new. As I sat there, I felt its subtle force. I've seen beaches at sunset, the sand uneven and disturbed by the thousands of feet that had trod there during the day. But in the morning, after the tide had come and gone, the sand was smooth and new, awaiting new steps to be taken. To say that time is like an ocean's tide is not a perfect analogy, but it is what came to mind as I packed my camera and left the church. Outside there were no soldiers waiting to execute me, only an old woman sitting on a bench, asking that I take her photo. And so I did. This article is from The Christian Science Monitor.